It is a long way from the Copa America to a League Two away trip to Accrington, but Exeter City's Joel Grant has experienced both in the past few months. 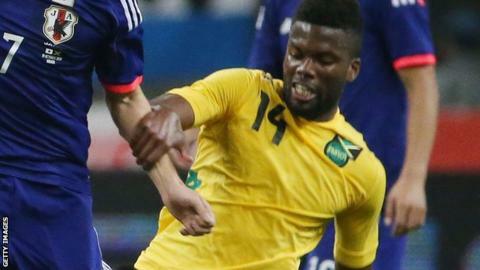 The former Yeovil and Watford midfielder was a member of Jamaica's squad when they became the first Caribbean nation to feature in the tournament. And that exposure to the likes of Lionel Messi, Carlos Tevez, and Edinson Cavani has inspired the 28-year-old. "I look at Lionel Messi and think why can I not be the best player in League Two?" Grant told BBC Sport. "It's a pleasure to see players of that level because it just makes me want to reach that level. "Exeter, Barcelona, why not? It's 11 against 11 and you never know what can happen in football. Just seeing them encourages me even more." The 28-year-old, who has won 12 caps for his country, joined the Grecians last month, thanks in part to a donation from the club's fans towards his wages. His travels with Jamaica as they aim to qualify for 2018 World Cup have limited his chances at St James Park to just two substitute appearances so far, but he scored in Saturday's 4-2 defeat at Accrington. The London-born attacker qualifies to play for Jamaica because his mother was born there, although he could have opted for his father's home island of Grenada. But despite being born in England, there was only one country he wanted to represent. "I often make jokes and say that I was born in the wrong country, but from probably three years-old I was always going back and forth to Jamaica and I saw that as my second home," he said. "It was always a dream to represent my mother's birth country and I took the opportunity as soon as I could, which was at Under-20 level, and I never really looked back. "It is kind of crazy to be honest, if you'd have asked me a few years ago I'd have never seen it, it would have never been possible, but now it almost feels normal." Grant has been part of the last few Jamaica squads, but has failed to make the starting line-up since winning his last cap as a substitute when the Reggae Boyz beat the USA to make the final of the Concacaf Gold Cup in July. They lost the final to Mexico, but performed creditably in their Copa America debut in Chile where they lost 1-0 to Argentina,Uruguay and Paraguay. A two-legged qualifying win over Nicaragua earlier this month has put Jamaica in a World Cup qualifying pool alongside Haiti, Costa Rica and Panama - with the top two progressing to the final qualifying group. "I feel this is our best chance since 1998 to get to the World Cup. The squad at the moment is very good. There's some very hungry young players and some experienced players as well. "We've got a few players playing in the Premier League and the Championship, which is similar to 1998," he said. But Grant believes the rise of the MLS in the United States has been key to Jamaica's recent progress, as their players can move there without the immigration issues they face in England. "To come to England, Jamaican players need a visa, but you have to be in the top 50 countries in the world for two years and we're just outside it, we're 52nd in the rankings. "Rodolph Austin was over in England for three years, but he got his visa turned down, which was unfortunate for him. "So the MLS is massive, especially for the local players because it's their chance to go and play against some top players." "Darren Mattocks, who people in America will have heard of seems to be getting most of our goals at the moment." In the shorter term, Grant's focus is on Exeter and he is upbeat about their chances this season. "I think the ambition should be promotion, whether that's through the play-offs or straight up," he added. "My experience through this league and what I've seen so far, I personally believe we have a squad capable of challenging. As an individual I'd be disappointed if we're not challenging."